Justice Leslie D. King is a native of Greenville, where he began practicing law in 1973. He graduated from the University of Mississippi in 1970, and from the Texas Southern University School of Law in 1973. Judge King was elected to the Court of Appeals in 1994 and began hearing cases in January 1995. 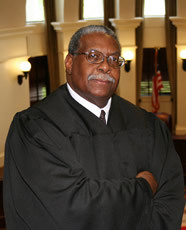 He served as Chief Judge from April 30, 2004, through March 1, 2011. Gov. Haley Barbour appointed him to a vacancy on the Mississippi Supreme Court. He took the oath of office to serve on the Supreme Court on March 1, 2011. He became a Presiding Justice of the Supreme Court on February 1, 2019. Justice King served in the Mississippi House of Representatives from 1980 through 1994. During his tenure, he was named vice-chairman of the Ways and Means Committee (1988-1991) and vice-chairman of the Conservation and Water Resources Committee (since 1992). Other committees on which he served include: Judiciary, Insurance, Environmental Protection Council, Housing Finance Oversight, and Universities and Colleges. He was chairman of the Mississippi Black Legislative Caucus in 1988. He previously served as Youth Court Counselor for Washington County, Public Defender, Youth Court Prosecutor, and Municipal Court Judge for the Town of Metcalfe. Justice King and his wife, the former Patricia Smith of Greenville, have two daughters and a granddaughter. They attend the St. Matthew African Methodist Episcopal Church in Greenville.